The Museum has assembled a representative wooden wagon train representing the early wagons used in the ironstone quarries from around 1920 to the 1930’s which often containing a mixture of wagon types, styles and sizes. Work is still underway to create this train but we look forward to the early introduction into our operational fleet. 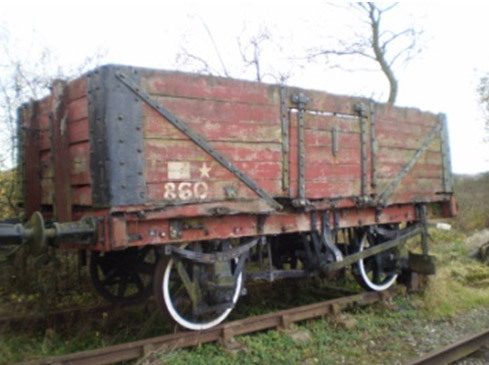 Eight plank side, end and bottom door mineral wagon built by Charles Roberts for the Newstead Coal Company Ltd – Blidworth Colliery and registered by the LNER in 1938 as No.11644. K2 – 1919 Ministry of Munitions Iron Ore Hopper Wagon (later converted into a tool van and awaiting restoration into original configuration). K1 – 1919 Ministry of Munitions Iron Ore Hopper wagon (later converted into a tool van and awaiting restoration into original configuration).